mountain of authors 2019…come see me! Hey, hey internet land! Long time, no post. Life just keeps on life-ing and I sometimes kind of forget that I’m supposed to be writing books, telling you all about them, and participating in anything outside the immediate chaos of day-to-day life. The exciting (nerve-wracking?) news is that this month I am participating in a real, live, author event where I will sit at a table and interact with other authors and hopefully some readers and pretend to be a normal. 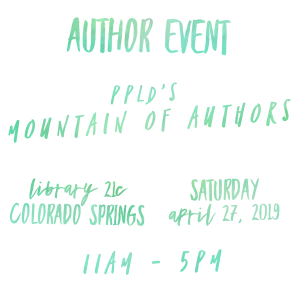 If you are in the Colorado Springs area, I’d love to see you at the PPLD Mountain of Authors event! I participated two years ago and it was a really good time! This year the keynote speaker is a YA author and I’m SO excited about that! Check out the Mountain of Authors schedule here.